My sewing/thread spools were all stored in a basket, the threads getting all tangled up, not making it easy to find the right color when needed. I knew there were thread racks around and started searching the www. Unfortunately I did not find what I was looking for ……. not the right style (too frilly to my taste), not the right place (way too much shipping to get it here) or looking unstable just from viewing the internet photo. 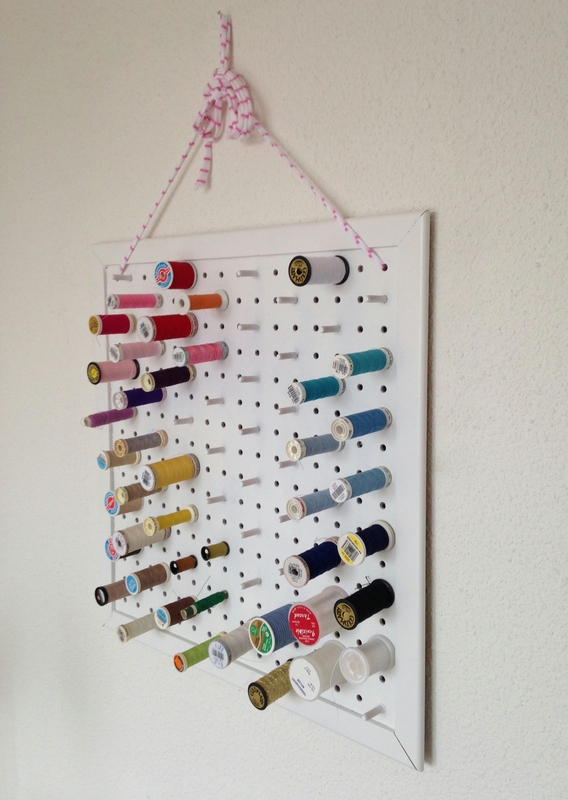 But, one of the google results was this ace website, where I found an excellent tutorial to make your own thread rack. 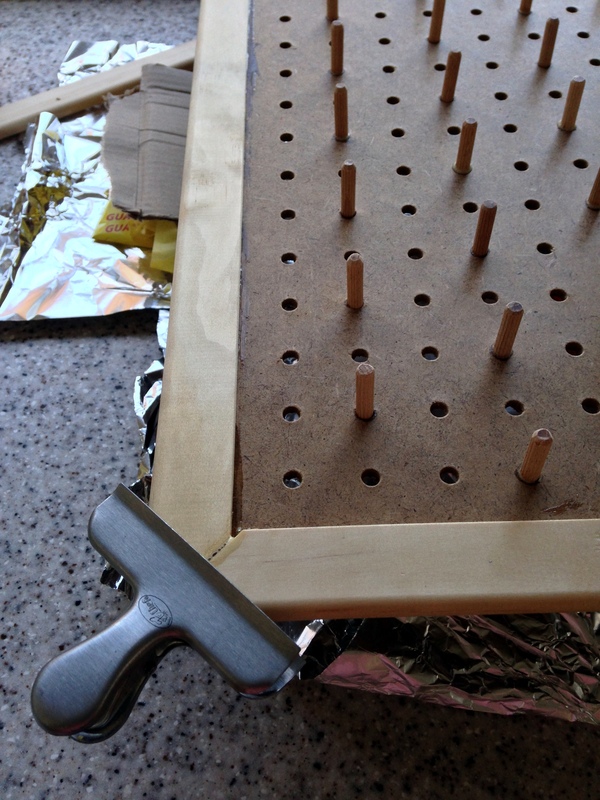 I immediately pinned this tutorial to my DIY-pinterest board and that came in very handy when I was ready to tackle this project. 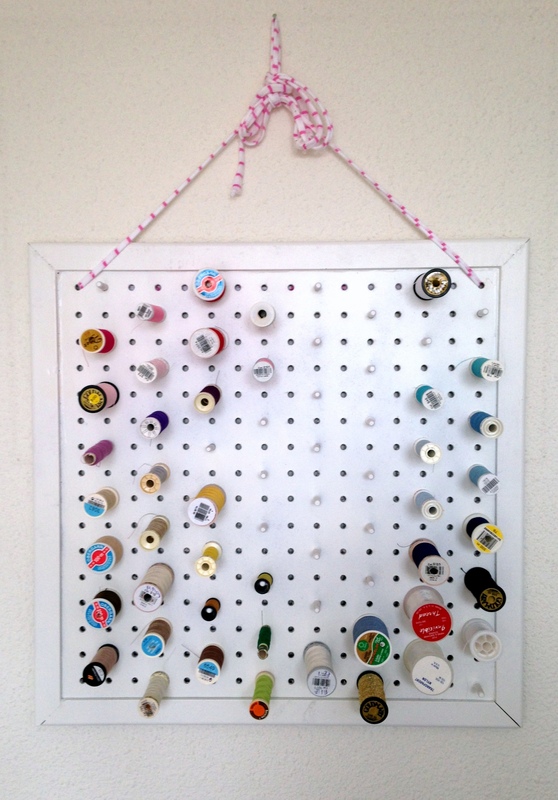 If you want to give this a go yourself, you can of course go to Mandy’s tutorial directly (here), but I just like to share with you how I went about building my very own spool rack! For starters I got a lot of help at my local hardware store. 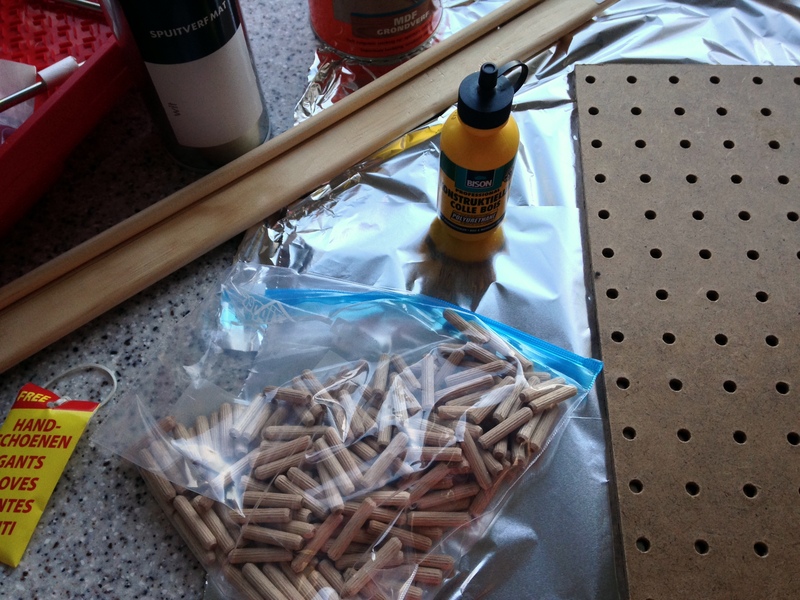 One of the guys cut the pegboard exactly the size I wanted for the thread rack and he did the same with the small wooden boards I wanted to use as a trim. 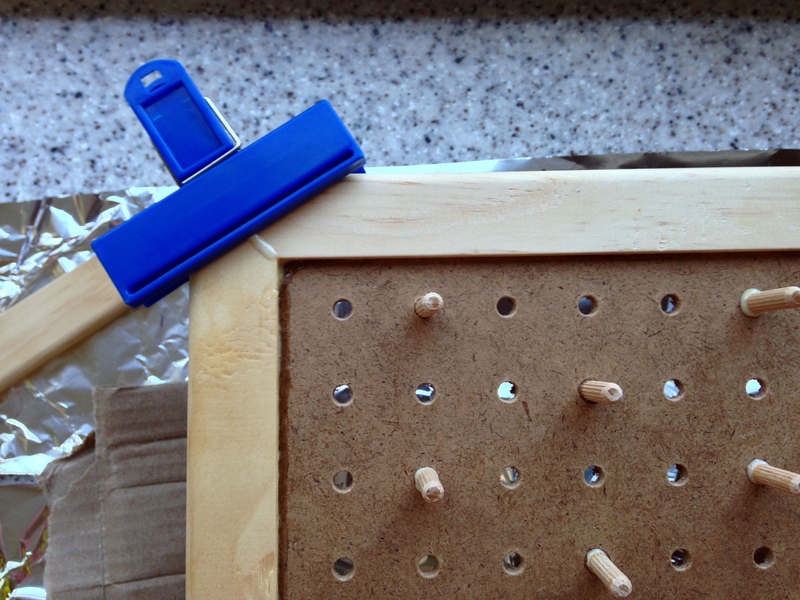 It was there too that I found a bag with dowels that fitted just perfectly in the little holes of the peg board. 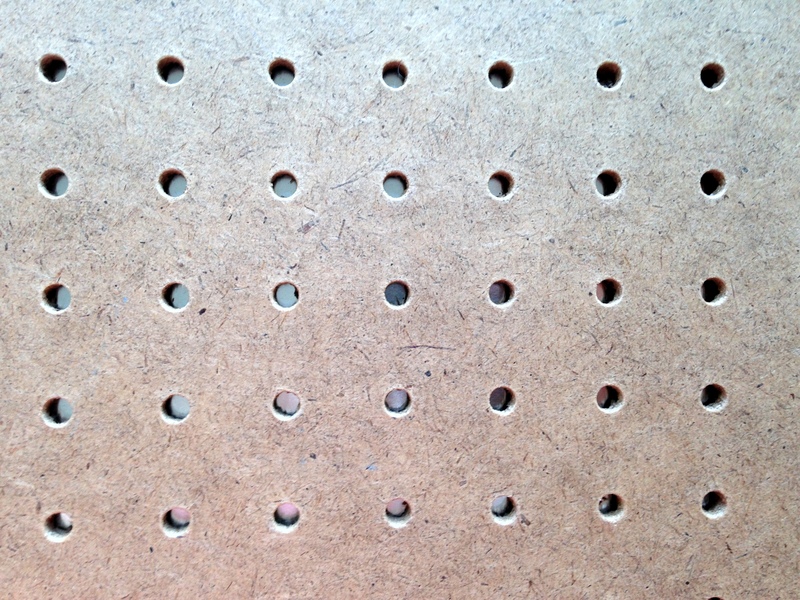 All I had to do was glue them into the holes, so they would be secured nicely. You may have noticed that I like to do things in a kind of ….. euh ….. methodological way, which means collecting all things needed ….. 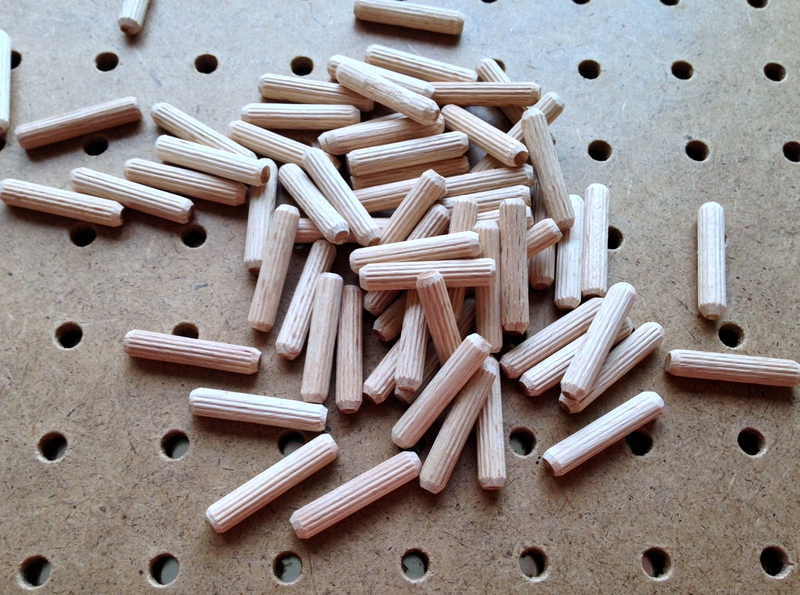 The next step was to glue the little dowels in the peg board holes – I just got a considerable glob of glue out and sort of dabbed the dowels in the glue ….. 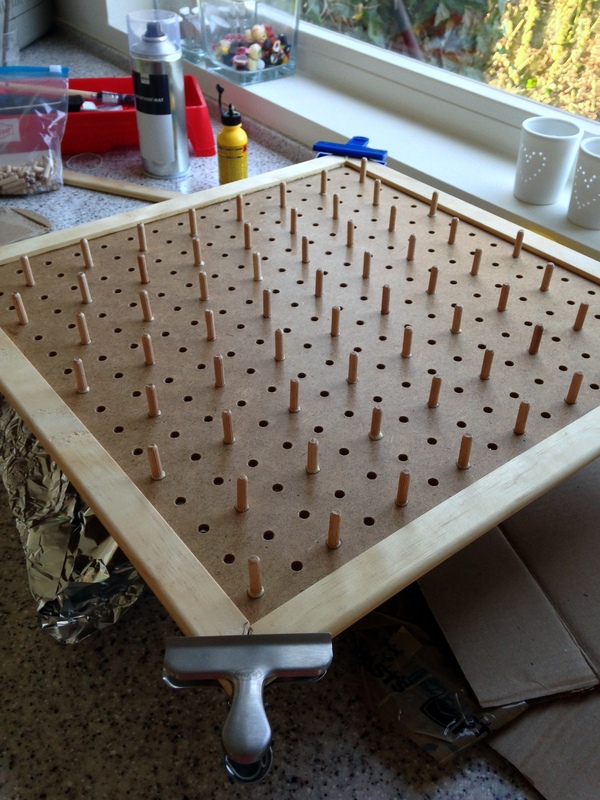 I then glued the trim boards onto the peg board, that is, I tried to do so …… Small moment of panic there: clamps were needed big time and sure enough this “methodological lady” did not have those on hand, grr …. What to do, what to do? 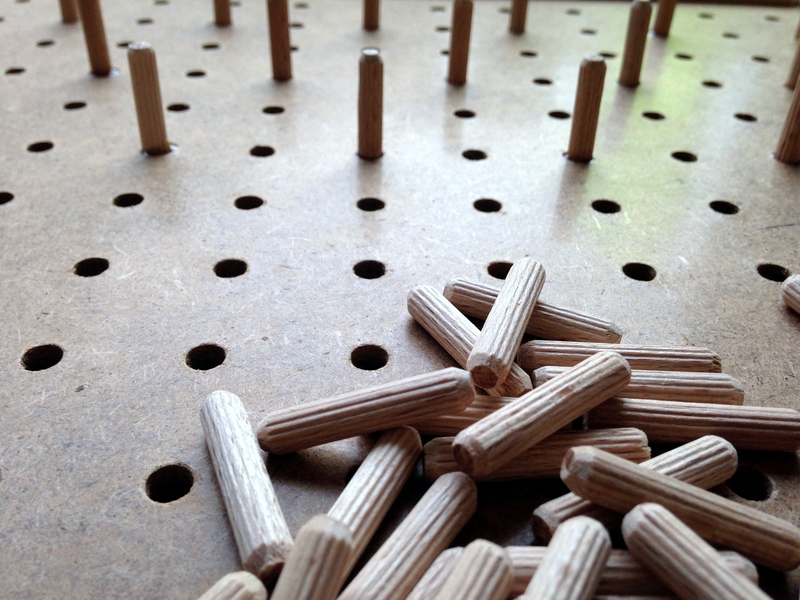 Drive to the hardware store – no, because all trims were full of glue, sort of glueing themselves to parts of the peg board, but at all four corners they were jumping up. 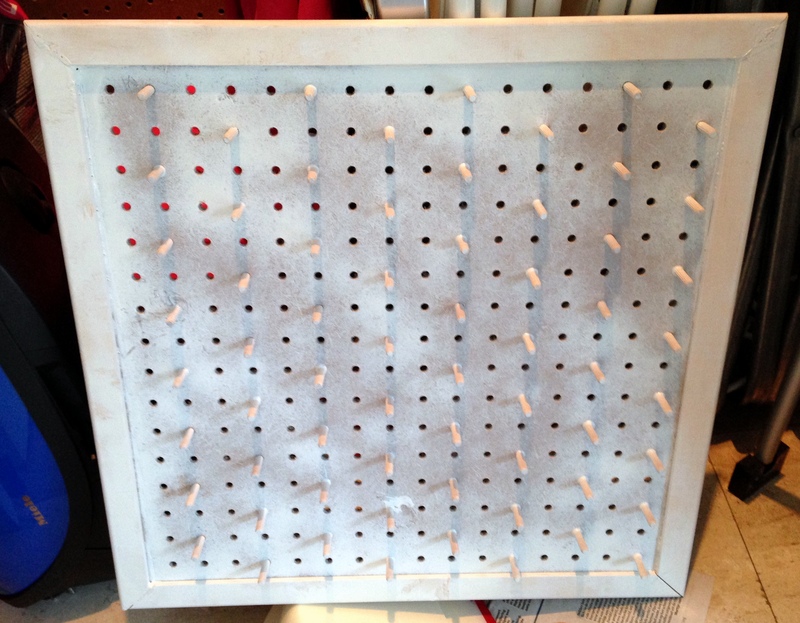 In the time I would go out and buy the so needed clamps, they would half-half be glued to the board. Frantically looking around my kitchen, a bulb went on all of a sudden: the chips clips! 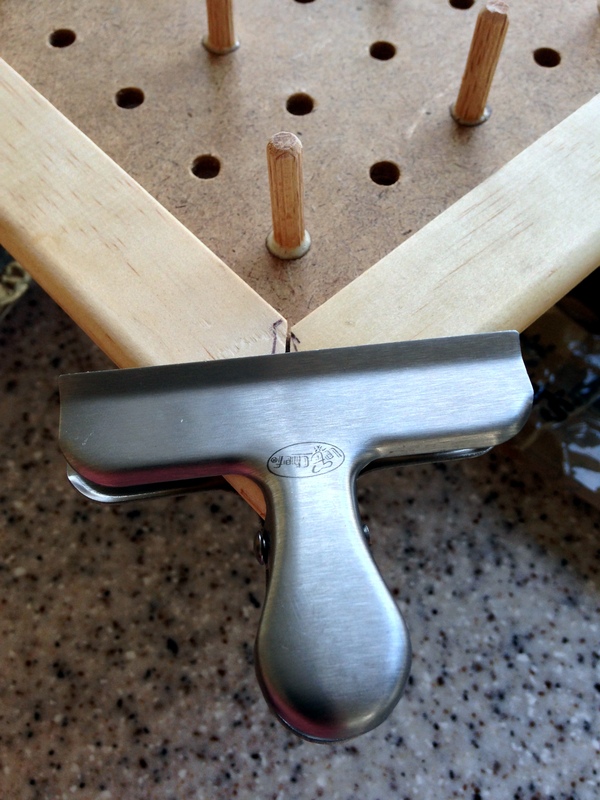 They might be strong enough to hold the trims down at the corners ….. And YES! they were – saved by 4 bag clips, kind of funny actually. 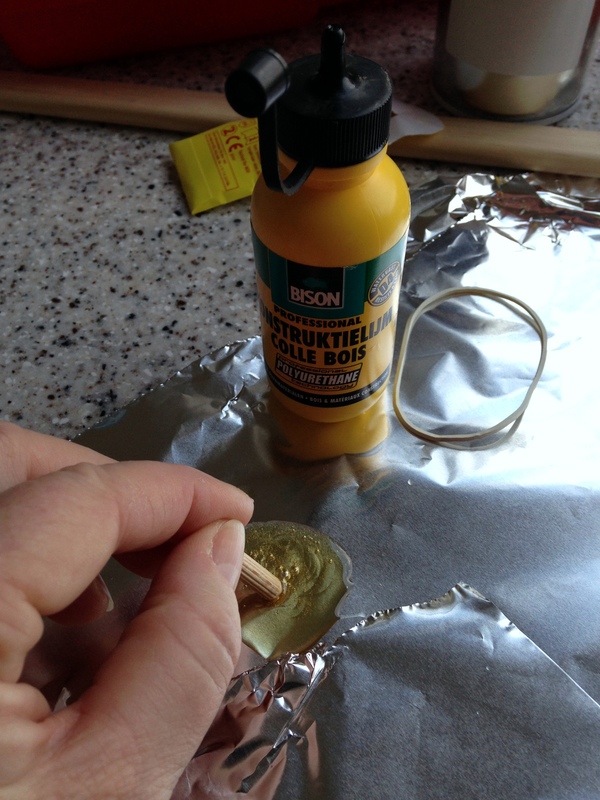 It took a couple of hours for the glue to dry properly, after which I could apply the first coat of spray paint – exciting! Two more coats were needed, but after that: ta-dah! I made my own spool rack and I LOVE it! I might make a second one to house my masking tapes, HA! Happy making and please send pictures – would love to see what you’ve come up with! This is awesome! Now I need to get to Ace Hardware up in Dubai and see if I can produce something similar!! Thank you!